Sprouts Cheela is also called Sprouts Moong Daal Cheela. 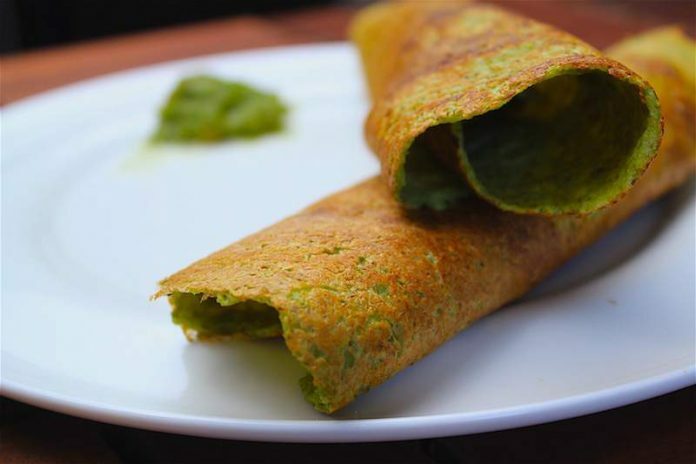 Mostly people make normal moong daal cheela, but to make it really healthy I have used sprouted lentil. In this recipe you can learn how to sprout moong. Its a really simple process but it takes time. 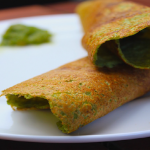 Sprouts cheela/Moong Dal cheela is a very healthy and simple recipe. I generally eat it in breakfast and snacks or sometimes in dinner. 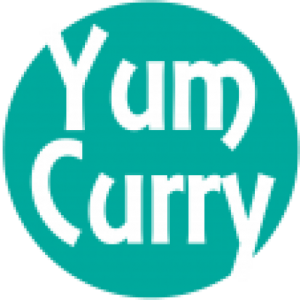 Generally it is served with green chutney, Tomato ketchup or Pickle. Take 1 cup of Moong Dal(whole). Soak it for 4 hours. Drain out the extra water from it and transfer it to an air tight container for 4-6 hrs. And Grind it to smooth paste. Now add Rice Flour an Gram Flour. Add more water if required to make a smooth paste. Heat the Pan/Tawa and brush some oil on it. Pour a scoop full of batter on it. Brush some oil on the chela and to the corners. Cover the Cheela and let it cook for 1 minute. After 1 Minute, it should look like this.